For those of you unable to attend KScope in San Antonio Texas this year there was some very informative sessions around the future of on-premise Hyperion Financial Management (HFM). This information was surrounded by Oracle’s standard “safe harbor” statement but it gives some idea of the direction and intent that Oracle is taking the on-premise consolidation solution of HFM. So don’t take anything I say as fact but rather what I understand as future trajectory. First, why is your environment version important? It is important for a few primary reasons. First and foremost is to fully leverage the system you own and functionality any functional improvements being made by Oracle. 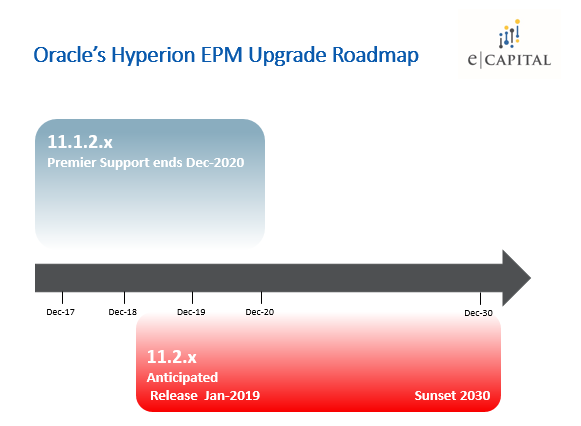 Version to version updates can have small or large functionality improvements depending on exactly how you use the EPM suite. Some recent examples are FDMEE (11.1.2.3x/11.1.2.4.x), substantial HFM consolidation performance increases (11.1.2.4.x) and custom dimensionality (11.1.2.2.x). The second reason is for technical support. This support can take the form of functional or technical support. Why would you need this? It may be that your environment doesn’t seem to be or isn’t functioning correctly. This is usually, but not always, related to creating new business processes. For example, integrating a new subsidiary and the consolidation gets hung up, trying to leverage percentage ownership due to business changes and results are skewed, etc. Some of these would be configuration related but some could be software specific. Also, from a system architecture standpoint things can change even if you aren’t altering how you use the system. There are a variety of system architecture/technical sources for required support. Some examples we’ve seen include a server patch bringing down the environment, changes to the back-end databases, communication issues, Microsoft version changes, etc. When does Premier Support End? The current understanding is that Oracle is committed to continuing to support HFM as an on-premise solution for the foreseeable future provided you are on the current/recent version of the software. The dates we heard at KScope were on-premise Premier Support through 2030. We also heard of a tentative release date of Early 2019 for HFM 11.2.x. Oracle will continue to focus on developing new functionality but that functionality will primarily be focused, at least initially, on the cloud offerings. This means that any enhancements of functionality will start in the cloud offering and may or may not make it to the on-premise solution. Oracle’s cloud offering for financial consolidation is Financial Close and Consolidation Cloud Service or FCCS. In the marketplace we have heard a lot of confusion about how this product works and it’s intended usage. Whether or not FCCS is a good fit for you is very much based on how you use HFM today and how open to process revision you are. FCCS is a much more plug & play product than HFM is and can provide quick implementations depending on how straight forward your consolidations are. FCCS obviously provides the benefits any of Oracle’s cloud offering bring around limiting your current infrastructure and eliminating version upgrades. We would be happy to have further conversations about how on-premise roadmap or if/how FCCS could work for you. Please contact us.